Our next regular singing will be Sunday, April 8th from 1:30-4:00 in the General Store at the Shiloh Museum of Ozark History in Springdale. As usual, you're welcome to join in the festivities, bring your children or a guest or two, and enjoy helping continue a traditional form of singing that came west with families loaded in wagons with our ancestors. Loaner books are available so guests can follow along and hopefully sing along if moved to do so. As usual, anyone who arrives around noon at Springdale's AQ Chicken House is welcome to join our table for good food and conversation. Just ask for the singer's table at the reception desk. One of the tasks for the April Sunday singing is working on any final plans for the Northwest Arkansas Sacred Harp Singing Convention in Harrison, AR on May 6, 2018, from 9:30 until 3:00 with a potluck lunch. More detail will be published with the May updates. 2018 Missouri State Sacred Harp Convention - On Saturday morning, the only "snow drops" were little white flowers found under the trees. 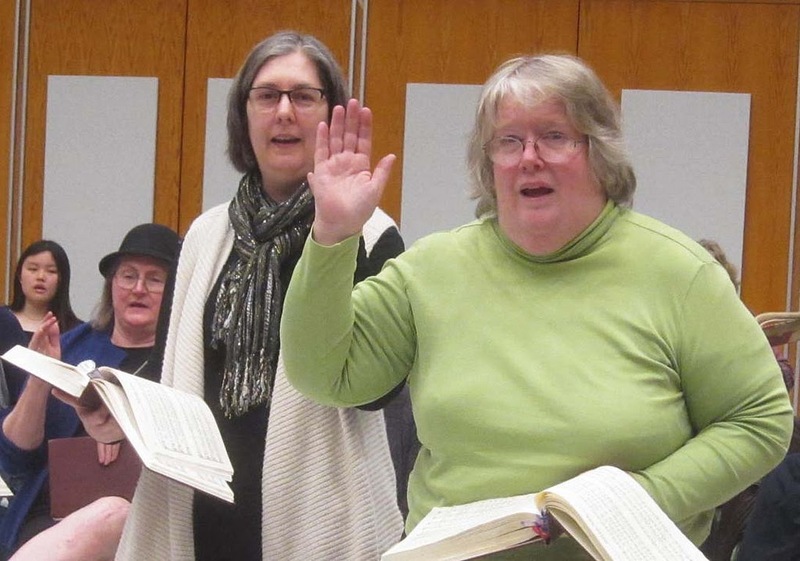 Sacred Harp singers from all points of the compass filled St. Johns United Church of Christ. The alto section was well represented. 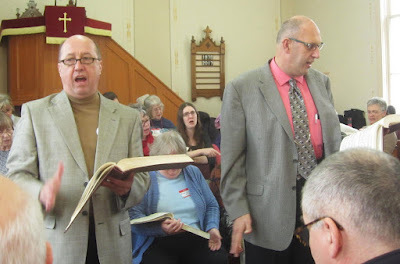 I'm very pleased to report that we had 11 Shiloh Singers at the Missouri State Sacred Harp Convention on March 10th and 11th. As usual the Saint Louis Shape Note Singers rolled out their welcome mat and conducted another wonderful singing. Missouri also includes a number of very fine cooks who prepared and organized two noon meals and food for a Saturday evening "gathering" at a local church in Washington, MO. There was plenty of time to renew friendships and catch up with family news. After a few years you recognize how much taller the children have grown and share a note of sadness when you notice an occasional empty seat. My hat's off to everyone who made this year's Missouri State Convention a memorable event. 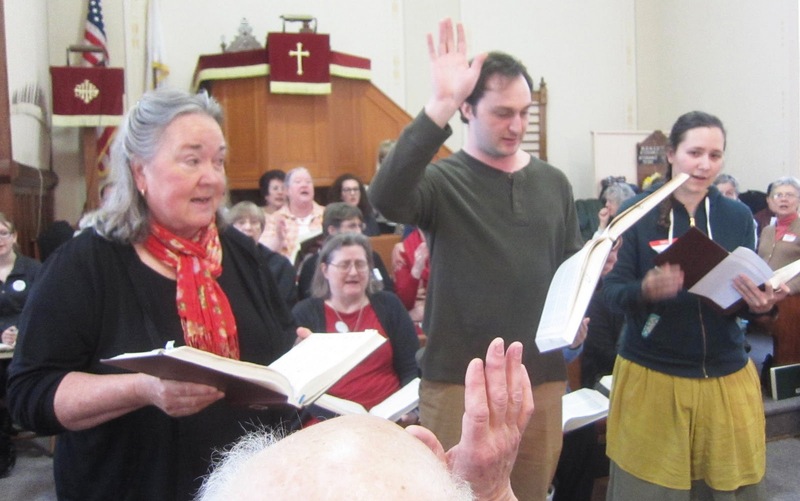 An additional well deserved photo credit: A special thank you to Martha Beverly for taking photos at Sacred Harp singing events and posting 14,416 of her photos on her website with 3.1 million views since 2006. You can visit her website at: https://www.flickr.com/fasolakazoo/albums/Martha's "Albums" are neatly organized by event and date showing photos of song leaders. While we're thinking about pictures of friends, Martha was in Ann Arbor for a recent singing. Syd Caldwell noticed that Martha had taken a snapshot of Michele Raine (L) and Marian Mitchell leading during the March 24, 2018 singing on the University of Michigan campus. Michele formerly sang alto with the Shiloh Singers of NWA in Springdale and is fondly remembered by her many Arkansas friends. One More Thing: You may have noticed some minor differences in the introduction used for the webpage update for today's edition. I'm sure you'll see more improvements and a fresh ideas in the near future. I ran out of different ways to say, "We'll be singing on Sunday at the Shiloh Museum" several years ago. I've been doing this newsletter since 2012 and I'm very pleased to announce that Margaux Burleson (alto section) and Darryl Criss (bass section) have agreed to work together on the webpage and newsletter respectively. You can help them by sending news of nearby events while I rest my typing fingers and like other old soldiers, quietly fade away. It's been fun and I've really enjoyed singing with you and plan to continue for many more singings in Springdale, in Missouri and elsewhere for as long as Katy will let me out of the house. Take care of yourselves out there.